A wonderful classic sailing yacht, the 54.35m Shenandoah of Sark is now on the market with Mike Horsley at Edmiston & Company. Built by Townsend & Downey in 1902, she accommodates up to 10 guests in four staterooms. Following several refits over the last 15 years, she is now in a condition which will enable her to go on into the next century as gracefully as she entered this one, with many more long and exciting voyages ahead. Her fine and sea kindly hull has already graced the waters of the Pacific, the Antarctic, the North Atlantic and many more, and now it is time for a new custodian to take the helm. 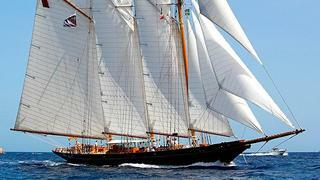 Currently in the Caribbean, Shenandoah of Sark is asking €15 million, VAT paid.